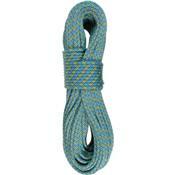 Move nimbly through the alpine world without dragging extra weight by bringing Bluewater Excellence 8.4mm Half Rope. Despite a slim 8.4mm profile, the Excellence defines its name by boasting a tightly braided double-pick sheath for extra durability, and at a mere 45 grams per meter you won't feel bogged down by unnecessary bulk. Bluewater added a Double Dry treatment, so even in surprise drizzle you know you won't be bogged down by water weight.